XEBEC Self-Adjusting Sleeve™ How to Use | 製品の使い方 | XEBEC TECHNOLOGY CO.,LTD. Self-Adjusting Sleeve must be mounted on equipment which enables to stop and hold the sleeve at the fixed position. Predetermined length can be adjusted between 0.05mm to 1mm in 0.05mm increments in a single action. The projection amount is adjusted at the predetermined intervals according to wear volume. 1. Figure out the amount of brush wear by process quantity or travel length. 2. Set and execute the macro program so that the projection amount is adjusted at the predetermined interevals. This is a method to adjust only the part that is worn out by one-time processing immediately after processing. By passing the side gear of main body through the rack gear immediately after processing, the brush projection amount is reset to the initial condition. This is a method to adjust the cumulative wear volume generated by several processing at once. By passing the side gear of main body through the rack gear once every several processing, the brush projection amount is reset to the initial condition. This is a method to measure the brush wear volume using the sensor inside the machine and adjust only when a certain amount is worn out. After processing, the sensor inside the machine measures the brush wear volume and decides whether adjustment is necessary. If necessary, the brush projection amount is reset to the initial condition. The concept and program are simple. One counter is required (for tool life). As the minimum adjustment amount is 50 μm, the wear volume per one-time processing must be more than 50 μm. Cycle time gets longer due to every projection adjustment. Recognition of the wear volume in advance is necessary. No minimum wear volume (wear volume: less than 50um/per time). It might be possible to shorten the cycle time of pattern 1 (Every-time projection adjustment is not necessary). A complicated macro program is required. (A program which decides whether adjustment is necessary or not). At least two counters are necessary. (for tool life and for judging projection adjusting) . Accurate projection adjustment based on measurement is possible. Recognition of the wear volume in advance is not necessary. The sensor inside the machine is necessary. Cycle time gets longer due to sensing. Micro program at some points is necessary. The following shows how three operating patterns will make an operation. 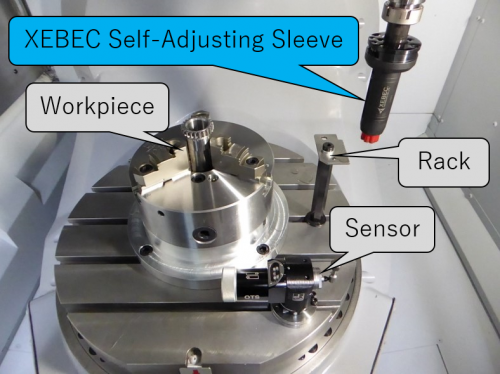 In the following, the target workpiece and the sensor inside the machine will appear in addition to the XEBEC Self-Adjusting SleeveTM and the auxiliary item, the rack. Please check the arrangement as shown below. The video is the same one as pattern 1. Predetermined Brush length is automatically projected and assists unmanned operation. Effective to eliminate human error, maintain optimal machining conditions and consistent machining quality.